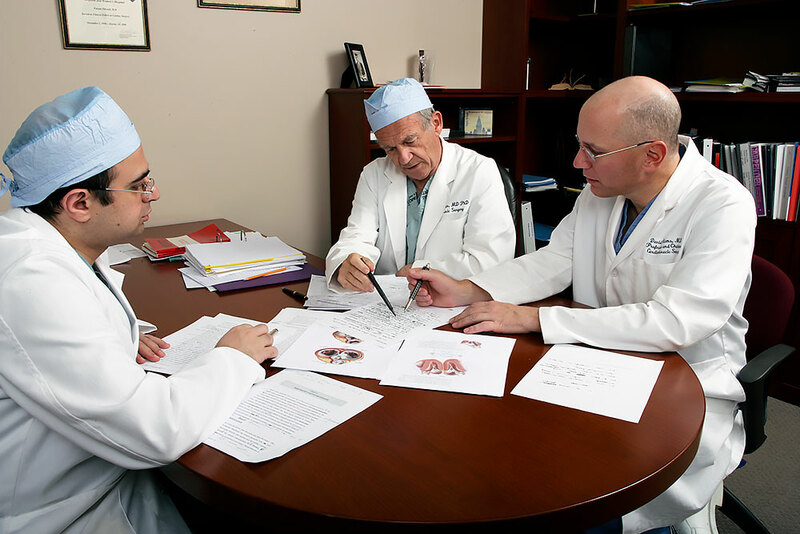 Dr. Farzan Filsoufi, Dr. Alain Carpentier, and Dr. David Adams at work on their textbook "Carpentier's Valve Reconstruction", which has gone on to become the widest-selling valve textbook in the world. Over three decades ago, Alain Carpentier, MD, PhD and colleagues1summarized the “Golden Rules” of mitral valve repair into three basic principles: preserve leaflet mobility, restore a large surface of coaptation, and remodel the annulus. Still applicable today, these surgical tenets allow reconstructive surgery in almost all patients with mitral regurgitation, provided there is an adequate amount of pliable and mobile leaflet tissue. 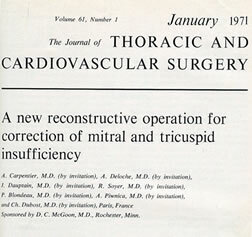 A systematic approach to mitral repair should be followed, including the determination of the exact mechanism of mitral regurgitation by intraoperative TEE and valve analysis, meticulous application of standardized techniques of repair, and evaluation of the quality of repair by saline testing and post-cardiopulmonary bypass TEE.